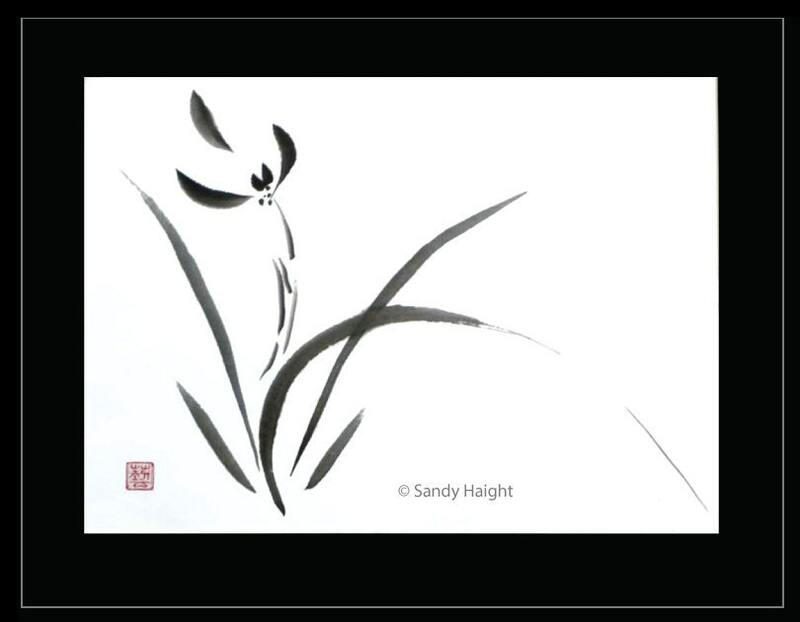 The wild orchid is a traditional subject for practicing the art of sumi brush painting. "The Orchid represents Spring, a happy spirit, the symbol of grace reflecting the ultimate feminine virtues. The orchid is considered the Mother of Brush Painting. The beauty and grace of the orchid are fragile in form, with no violent tendencies, its fragrance is never overpowering. The wild orchid grows in what is considered the most inspiration of all places, where the mountain meets the water or where yin meets yang. The orchid stands at the gateway of Spring inviting everyone to join in the celebration of life." quote: silverdragonstudio.com. This rendering has a special feeling as the brush lifts and lands again on the paper while rendering the forward leaf. Our eye fills in the missing detail giving it an ethereal feeling of twisting in a breeze. This is an original painting, not a print. It is painted on rice paper with sumi ink, the painting was mounted on masa, signed with my name and a red chop that means "Art". The painting is matted in black with a black matte metal frame as suggested in the image. It is ready to hang and add grace and beauty to any room in your home. Artwork comes with a signed certificate of Authenticity. (The copyright notice is not part of the product, just protecting use of the image file). Image size: 15.5" x 11"
In 2012 I qualified to be a signature member of the Northwest Watercolor Society (NWWS). This is earned by being juried into a select number of local chapter and international watercolor society shows sponsored by NWWS. Check out the Floralscapes section of my shop to see these watercolor paintings. Copyright Sandy Haight. All rights reserved.